**Note: **These sensors used to have only three pins but they're made with four now. The sensor works the same way as before. See the datasheet for details. Can this be used in a freshwater fish aquarium? Speaking of using this in a home brew application, is it food safe? How about in 170 degree F water (plain, filtered tap water, on the input tank to my brew system, picture a hot water heater, basically). The data sheet says it's only good to 150F, and is silent regarding food safety. MinoneTech, any plans for a food safe at 212F version of this? Every geek homebrewer would buy three. Just want to add a few notes for those who don't bother reading the datasheet (me!) and who may be considering this for liquid measurement. Firstly, MiloneTech apparently has great tech support, even for the dumb questions. :) Seems like a great company, a small business (I assume) in NJ. This has three pins for connections, which may lead you to believe that it is the voltage divider. Not so. The middle pin is inactive, the outer pins are simply either end of a variable resistor. 'Simply' isn't completely accurate- there's some cool printing tech going into making these things, and I don't mean to diminish that-- but you can look at it like your basic variable resistor. If you want to go the op-amp route, there's a diagram on the datasheet, otherwise assume it is half of a voltage divider. the vent hole is fitted with a hydrophobic membrane which prevents water from entering the sensor envelope. But don't expect to get any change in resistance after the liquid has passed that line. I've got two SEN-10221's on the bench now that I hope to use in the touchscreen-clothes-washer project. If all goes well, I'll add a third to keep track of the level of soap in the soap reservoir bucket. A lot of work, but I haven't seen a washer that will email you when it's done with the cycle, and even if someone made one I probably wouldn't want to pay what they were asking for it!! Would household sewage be considered a corrosive liquid? I'd like to use this for a sewage ejection tank monitor. Will work fine in household sewage. Are there any plans for a corrosive liquid version? In my case I would be interested in one that could handle salt water (marine) applications for extended periods (months to years with proper cleaning/maintenance). This sensor will hold up well to salt water/marine environments. We are developing a chemical sensor for use in fuels, solvents, strong acids/bases, etc. The data sheet indicates non-corrosive liquids and in my experience marine environments happen to be one of the worst for electrical gear of any sort. I think I will hold off until you have that chemical version ready or some tests showing it will survive in a marine environment for at least a year. It is not just the water but also vibration from water movement and other sources that cause damage. The non-corrosive liquids referenced in the datasheet was meant to address strong acids and bases. The eTape sensor envelope is made of PET, the same stuff water bottles are made from. The concern is not the sensor envelope itself but the adhesive that we use to form the envelope which is susceptible to solvents, acids, etc. The chemical version of this sensor will do away with the adhesive. Since the eTape is a solid state sensor and has no moving parts it is not affected by salt creep, etc. A chemical sensor would be great to use in an autonomous nitro/gas helicopter. Would a pressurized tank cause a problem with this sensor? Cheaper nitro heli and car tanks use exhaust pressure to help feed the engine. The chemical sensor we are developing does not require venting and won't have any issues with a pressurized tank. I just bought this sensor and was wondering how to protect the pins from salt water. Can I attach the Swiss pin connectors and then epoxy over all the exposed parts ? Do you - or could you - stock a suitable connector? If you do not (why not? ), can you please recommend one? I have an application for something like this, however the temperature of the water in which it will be in will be @ 150 degrees F, is it still safe @ 140deg F (longevity wise) i may be able to dial the temperature down. Also what controller could I use with this to trigger a relay to shut the system down when water is no longer present. Check out this demo video on the liquid level sensor => http://www.youtube.com/watch?v=Lu_9eiPu_pA. The resistance is linear with depth, but if you want real accuracy and millimeters count, I found the best way to do it is to use the internal resistor (pins 1 and 4 on the sensor) and the reference instead of an external 1,500 ohm resistor. Then, the REAL way to get solid readings is to do your own calibration. Read the analog values for every 10 millimeters of water you can read on the strip then use this great code found here: http://playground.arduino.cc/Main/MultiMap to do a non-linear map of the real world values to the calibration you did. Using this method Ive been able to get accuracy down to the millimeter read directly into the arduino with little guesswork. I'm willing to bet it would be even more accurate if I was more careful about measuring the meniscus! Will this sensor work with water-based household paint? I want to make sure I am doing the temperature compensation here correct. What I am doing now is using the internal reference resistor as my voltage divider so that both resistances change with temperature at the same time. In my code I have a constant value for the reference resistor in my voltage divider calculation. Is this sufficient or should I be reading both the reference and the level resistance into my microcontroller via their own independent voltage divider circuits and then adjusting the resistance in the level resistance according to the change in the reference. Has anybody done temperature compensation for these? Yes, the eTape sensor can be used to measure pourable solids like sand,grain and powder. According to the datasheet, this sensor is good up to 150F. Does anyone know of a similar sensor that can do higher temps (close to 200F)? Has anyone tried using this sensor at high temps? I ordered one a few weeks back, just now starting my project. My question is is that it has four pins instead of three so I'm wondering what the difference is. The documentation says it has three pins also so I'm a little confused. Sparkfun is now carrying the new version of our sensor which has four pins instead of three. The datasheet has been updated and the photos will be updated shortly. The currently linked datasheet also has four pins, instead of three, so I'd go by that. 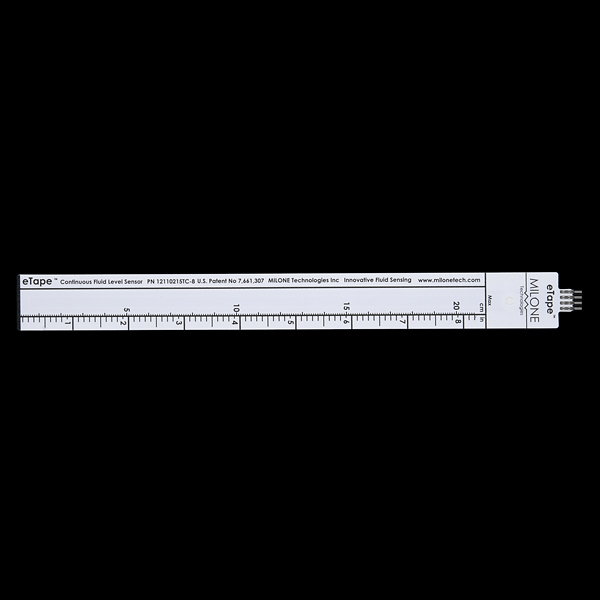 According to this datasheet inner pair is connected to the sensor and the outer pair is labeled as a reference (specifically a constant 1.5 kÎ© available for use in a voltage divider or other circuit, which is a nice addition). Since they both are resistors, they aren't polarized and it doesn't matter which pin in each pair is used as the high side (provided the other is used as the low side, of course). Small confusion. I looked over the datasheet and saw "Sensor Length: 10.1" (257 mm)" I stopped reading and ordered when I got it sensor was only 8 inches. I reread the datasheet and saw "Active Sensor Length: 8.4" (213 mm)"
When are you guys going to get some longer sensors? I can use this one right now but I will need longer ones soon. Picture shows three pins. Datasheet shows four pins....which one will I get? Couple of things I wish they'd change about this: first, there is no change in resistance for the first 1" of liquid level, which makes it more challenging to use if you're looking at lower liquid levels. Second, a wider resistance range would be much easier to work with. Right now it only varies between 0 and 700 ohms. 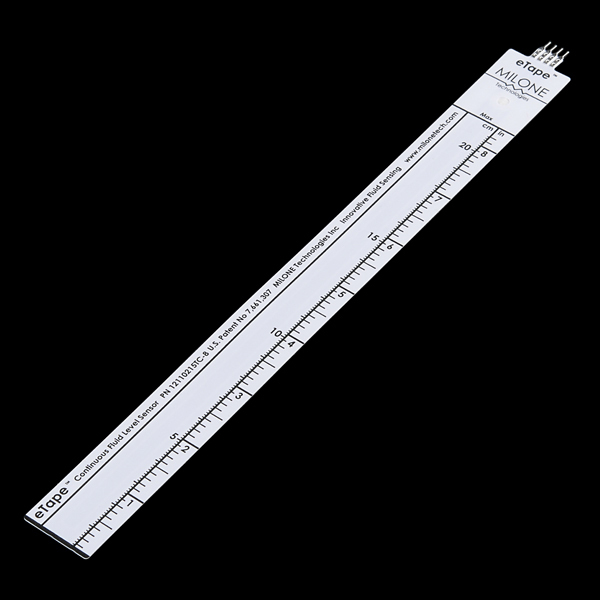 So if you plan on using a voltage divider to measure the resistance changes, you're going to be stuck with low resolution or wasted energy. Bit, We have expanded the resistance range (300 to 1.5K ohms)on the latest version of our 8" eTape sensor. 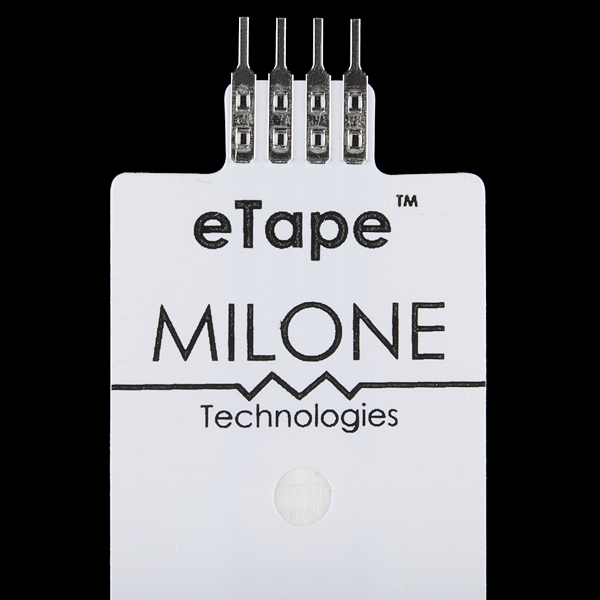 The new eTape sensor also includes a reference resistor for temperature compensation when the sensor is used over a broad range of temperatures. Does anyone have any mounting ideas - It is very sensitive to being twisted or bent with consequent wild variations in resistance, but the datasheet doesn't explain how the bottom should be restrained. To keep it perfectly flat I'm contemplating putting it on fibreglass sheet with blobs of epoxy at intervals along the edges. Hopefully this wont disturb the measuring mechanics. It reads something like 160 when the water is at the bottom of the sensor, and goes up to about 30 when it is close to the top. Mine also came in a box that was too small for it and was bent when i received it. After laying it flat on a table with some weight on it for about a week it flattened out. It doesn't seem to have been damaged by it, but would be nice to be shipped in a rigid tube as suggested. Any chance of a smaller version of this coming along? Say about 2"?? I need to keep a fish tank at a specific lvl and I live in the desert so it evaporates rather quickly, but I do not need 8 1/2" of sensor range. Not as likely, but how about at boiling temps? The sensor will hold up fine in dilute ethanol. As mentioned, this isn't designed for use in solvents. Would it hold up in a home brewing tank with 8% ethanol max concentration? Sparkfun shipped me this sensor in too small of an envelope, and they even wrapped it around a box of ICs! I just spoke with the president of Milone and confirmed this sensor is delicate and cannot be bent/crushed. If you order this device, DEMAND that Sparkfun ship it in a flat, protected container. "another distributor" has a 12.6" version of this... and they ship in a uline carboard tube. Nice. SF Folk: Use these! I needed ~20" of tape, so I'm using one 12" tape and one 8" tape, connected in series. Exxxxxcelent! Can you series the etapes up to measure more depth? Is it okay to cover vent hole with liquid ( the one used for atmospheric pressure compensation)? I'm trying to read this with Arduino - 5V connected to one lead, other connected to an analog port, but it continuously reads 1023 (and fluctuates when disconnected). I see in the example code for the Stamp the RCTIME function is used, but this function shouldn't be necessary with A/D, correct? Also, I'm assuming a certain volume of water isn't necessary (I have it in a few inches of water in a plastic cup). Many thanks for any help with this. The sensor acts as a variable resistor. You need at least another resistor and while they are many circuit configurations you can use, the simplest one is a voltage divider. I have made a video on how to use this sensor here Arduino Liquid Level Sensor Reading Code and Schematic, it will shows you the circuit configuration you need and code to do exactly what you are trying to do. You need to use the sensor in a voltage divider circuit or an op-amp circuit. Check the datasheet for more info. I wish the datasheet would give more information pertaining to safe pressure operating conditions. Also what other elements/chemicals need to be taken into account for use. New sensors for chemical engineering applications are always good though. I'm going to second the notion that fillibar has mad. I would love to see something that coult stand up to a marine application as this could have the makings of a great Auto Top Off sensor. Ah, just in time to build an automatic watering device for my Christmas tree. This, a voltage comparator, and a water valve solenoid. Well, actually it's a little late for this tree. Maybe next year. Obvious spelling error. "aas" to "has"
Love this liquid level sensor! Made it part of my IoT network at home. Connected it to a PIC16F684, which is constantly measuring the water level in my sump tank. If the water level reaches maximum, a spare sump pump kicks in and I get notified on my phone. Cool stuff!